Do you absolutely hate the way that your concrete driveway, patio or walkway looks? There’s a really simple way that you can fix that and start taking pride in your concrete surface again. 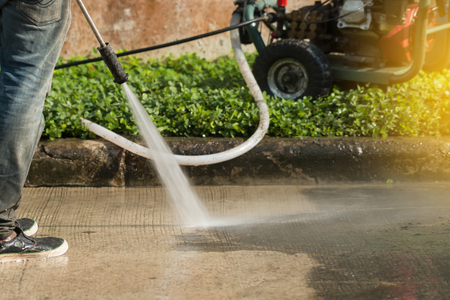 By power washing your concrete, you can bring it back to life and make it look like brand new again. Dirt, oil, grime and weather can take a toll on a concrete surface and make it look terrible, but by power washing a patio or driveway, you can completely transform its looks in just a few hours. Beyond aesthetics, there are several other benefits that come along with power washing concrete, too. Check out a few of them below. Power washing concrete will make it last longer. In general, you should power wash an exterior concrete surface about once every year or two, not just so that it looks good, but so it lasts longer. The reason behind this is that all of the different substances that build up on concrete can seep down into the material, leading to damage it that can mean you have to replace it much earlier than you would if you power washed it regularly. Concrete is known for being very durable, but that doesn’t mean that you don’t need to maintain it. Plan to wash at least once a year to the best longevity and performance. Power washing concrete will improve the overall integrity of it. Most people install concrete driveways, patios and walkways in the first place because they know that concrete won’t crack, chip and break like many other surfaces will. However, if you fail to power wash your concrete regularly, you will find that many of these imperfections will start to compromise your concrete. Cracks and other blemishes can set in, in turn leading to faster wear throughout the year with freezing and expansion, meaning your concrete won’t stay as strong as it once was. This could result in safety issues with your concrete over time, not to mention deteriorating looks and a shorter lifespan. Power washing concrete will allow you to seal it. Are you planning on sealing a concrete surface? Before you do, it’s important to make sure the surface is clean so that the sealant takes hold. Power washing concrete is the most effective way to get any concrete surface as clean as possible. If you don’t power wash before you seal, you are pretty much setting yourself up for a disaster later. If you’re planning to put on a layer of sealant, take off a layer of dirt and grime first with a power wash.
Do you need help maintaining your concrete surfaces, or would you like to install a new concrete surface sometime soon? Templin Concrete Construction can help with all of your concrete needs. Call us at 612-388-1945 today to set up a consultation.